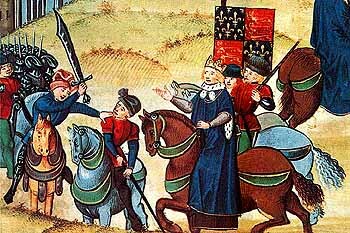 Walter Tyler, commonly known as Wat Tyler (1320 – June 15, 1381) was the leader of the English Peasants' Revolt (1381) also known as Tyler's insurrection. He has been described as the hero of nine days, referring to the length of the uprising. Social unrest in the wake of the Black Death encouraged peasants in various parts of Europe to rebel against the feudal system. Religious teaching associated with such figures as John Wycliffe and John Ball stressing individual worth and inner-renewal combined with the equalizing lesson of the Plague, from which nobility of birth was no protection, to inform new notions about social and political organization. An immediate incentive to rebel was the imposition of a new tax to finance the King's wars in France, which were his personal project and did nothing to benefit the population, who had no interest in these endeavors. On June 7, 1381 rebels met in Canterbury and elected Tyler as their leader. The rebellion spread to London, where it was crushed, and Tyler killed. Tyler had been elected their leader. Marxists would later depict the rebellion as an early episode in the class struggle. Tyler has served with distinction at the Battle of Poitiers before becoming a blacksmith in the Kent village of Broxley, where he may have been born although some sources cite Essex. It is not unusual for details of the life of a peasant, even one who rose briefly to prominence, to be vague since few if any were generally kept and what we do know is filtered through the lens of his enemies. Tyler is believed to have been born around 1320, probably in Broxley, six years after the Battle of Bannockburn and the thirteenth year of the reign of King Edward II. His father was Walter Hilliard, a roof tiler. From Life and Adventures of Wat Tyler, the Brave and Good, published in 1851, historians have reconstructed his youth, prior to his appearance as a historical figure. An early event is detailed in this history. With the help of fellow-villagers, Tyler routed out a nest of robbers which had plagued his neighborhood. Following a failed romance he joined the English army which was then preparing to leave for France. He was present at the Battle of Crécy where King Edward II appointed him to assist the courageous Black Prince. He was cited for his bravery in the Battle of Poitiers and a number of naval engagements with Spain and France. After his military service, Tyler returned to Broxley, married, and became the village smith. He does not appear to have had any political ambition but his peers must have been aware of leadership qualities, since they elected him as their leader at the beginning of the revolt. Tyler is said to have attacked and killed a tax collector who stripped his 15 year old daughter naked in order, allegedly, to determine whether she was old enough to pay the poll tax, which encouraged his fellow peasants to rebel. As news of rebellions of the lower classes in France and Flanders reached England, some peasants there readied themselves to rise against the social system that saw them as expendable. John Ball as dissident priest gave early support, preaching to the peasantry that they should resist by force any additional oppression by the state. The continued prosecution of the war in France and new taxes became more than the general population could tolerate. The legal system, too, was shutting out peasants' suits from its jurisdiction, refusing to adjudicate in matters concerning peasants' complaints or rights. Civil suits took years to be heard, if at all. Specifically, Edward III's death had resulted in his eleven-year-old grandson, Richard II, coming to the throne. As a minor, the Dukes of Lancaster, York, and Gloucester governed in his name. Unsuccessful expeditions against France followed, which left the royal coffers empty. The government decided to resolve this with a new poll tax of three groats, which outraged the people. The King's and the nobles ambitions in France, largely a result of the Norman Conquest which embroiled the English kings in French affairs because they saw France or certain French territory as rightfully theirs, was of little concern to the peasants yet they were expected to pay for these military expeditions, as well as to serve in the army. Following the incident concerning his daughter, Tyler, selected by rebels as their leader, first supervised the successful taking of Canterbury. He then led the rebels to Blackheath outside London, by which time they may have numbered up to 100,000. They invaded the city, which resulted in the murder of the Archbishop of Canterbury, Simon Sudbury and any judge or attorney on whom they could lay their hands. Sources say that the rebels were forbidden from looting or from keeping any valuable they found but were instead instructed to destroy these. King Richard II realized that he faced, potentially, a serious threat and rode out to meet the rebels, promising to listen to and to address the peasants' grievances. William Walworth (bottom left), kills Wat Tyler, at London Bridge. Twenty thousand people assembled at Smithfield, surroundig King Richard II. Accounts vary. It is said that the king asked the assembly what they wanted and that they replied, 'freedom', for themselves and for their heirs. Other accounts say that Wat Tyler went to speak to the King alone, saying, "King, do you see these men?" "Yes; what dost thou ask?" was the reply. "And thinkest thou, King, that these people, and as many as are in the city under my command ought to go without having had thy letters? Oh! no, we will carry them with us." Wat gesticulated frantically. At this time the Mayor of London went forward and addressed him. "Scoundrel! how dare thou thus behave in the presence of the King, and utter such words? It is too impudent for such as thou." "Lay hands on him," said the King. "Hey, in God's name," replied Wat to the Mayor, "what I have said does it concern thee? What dost thou mean?" "Truly," answered the coward, who finding himself supported by Richard, grew bold, "does it become such a slinking rascal as thou art, to use such speech in the presence of the King, thy natural lord? I will not live a day if thou pay not for it." The Mayor quickly drew his sword, and slashed the unarmed Wat Tyler to the ground. In the next instant, the body was stabbed by one of the King's squires—John Standwich. Some accounts suggest that Tyler insulted the king to his face while drinking from a glass of beer. Other accounts say that the King declared to the crowd that they should not follow Tyler, who was a traitor, but himself. The rebellion ended shortly after Tyler's death. His name, however, served to become a watchword and a rallying cry during public demonstrations and rebellions throughout the later medieval period. In the nineteenth century, the 1851 biography and inclusion of Tyler in the popular historical fiction of writer George Alfred Henty (1832-1902) offered a more sympathetic account of Tyler's life perhaps as new ideas about equality and democratic governance took root. A red dagger symbol seen in the coat of arms of the City of London and the Corporation of London is believed to represent the dagger of the Lord Mayor and thus celebrate the killing of Tyler. However it is likely that the symbol actually represents the martyrdom of St Paul, London's patron saint. There is now a country park next to the Thames Estuary in Basildon, Essex, named after him, Wat Tyler Country Park. There is also a public house in Dartford, Kent named the Wat Tyler, reputed to have been used by the eponymous rebel when the peasant army camped on East Hill, Dartford en route to Blackheath. There is also a road in Maidstone named Wat Tyler Way. ↑ London, H.G. Collins, 1851. ↑ "Watt Tyler's Rebellion," Watt Tyler's Rebellion Retrieved December 26, 2007. ↑ "English Peasants Revolt, 1381," Sources of British History, Britannia.com. English Peasants' Revolt, 1381 Retrieved December 26, 2007. Froissart, Jean. Froissart's Chronicles. London: Harvill Press, 1967. Life and Adventures of Wat Tyler, the Brave and Good. London: Collins Publishing, 1851. New York Daily Times, Historical, Biography of Wat Tyler. October 28, 1852. The Death of Wat Tyler (1381) - a description, from a chronicle of the time, which relates the final meeting between Wat Tyler and King Richard II. 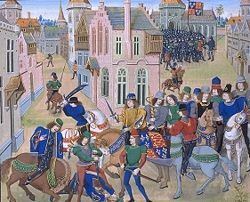 Wat Tyler's Rebellion - 1381 A. D.
This page was last modified on 19 October 2016, at 15:52.